TAMPA — Politicians and planners will meet again today for an update on Tampa Bay's latest proposed solution to its transportation struggles. Bus rapid transit, also known as BRT, has arisen as the leading option in an ongoing study to find the best regional transit project for Tampa Bay. The members of the Transportation Management Area Leadership Group — which includes politicians and transportation planners from Hillsborough, Pasco, and Pinellas — will meet at 9 a.m. at Tampa International Airport for the latest update on the proposed 41-mile route connecting the three counties. BRT is different from regular buses. Often the buses look sleeker and have more amenities, like automatic glass doors on the stations, than regular buses. But the main distinction is they travel in their own lane, as opposed to merging in and out of regular traffic. 2. In order to qualify for federal funds, a BRT system has to have its own, dedicated lane for at least 50-percent of the route. 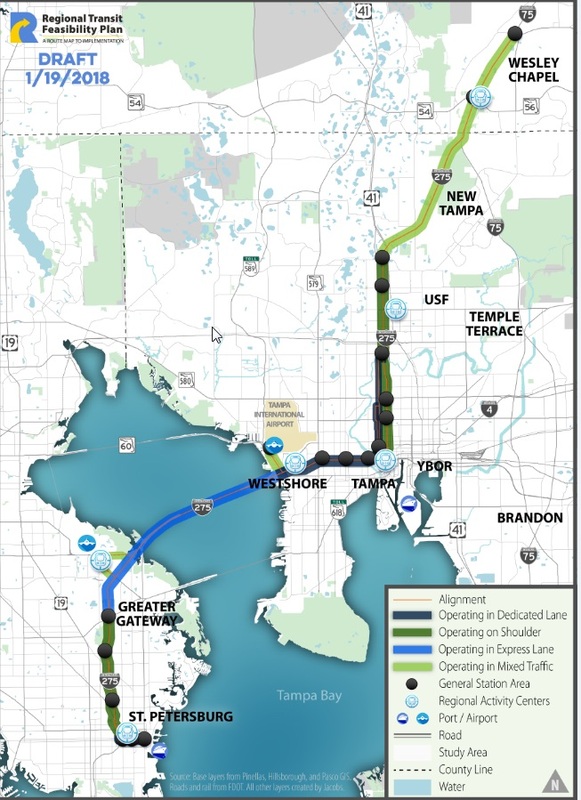 Though the TMA has been discussing a 41-mile route, future grant applications would focus on the 31-mile section connecting St. Petersburg to the University of South Florida in Tampa. Of those 31 miles, buses would have their own lane for about 20 miles. This could be an entire new lane, or it could be a managed toll lane, like those proposed for the Howard Frankland Bridge. On other parts of the interstate, it could use the shoulder or breakdown lane, a concept that transit agencies have used in cities like Chicago. Buses would travel in the same lanes as regular traffic for the 10 miles from USF to Wesley Chapel, said Kyle Parks, a spokesman for Jacobs Engineering, the firm putting the plan together. 3. BRT is cheaper than rail, but might not bring the same development. BRT advocates tout the fact that it is less expensive, quicker to build and more flexible than light rail. Because the system isn't rooted in the ground, like fixed-rail options, it might not bring the same transit-oriented development that light rail supporters are so fond of — though both systems can be built around robust stations. 4. The proposed system has faced some push back, particularly from Hillsborough County Commissioner Pat Kemp. Some traditional transit supporters, such Kemp, said that the version of BRT that Jacobs proposed falls short of expectations. "I really don't have confidence in what's being put forward," said Kemp, who has spent the past month criticizing the project. Representatives from Jacobs addressed some of those concerns at the last TMA meeting. 5. BRT won't be up and running — or even approved — any time soon. The Jacobs team will spend the next few months presenting the plan to the public and gathering feedback. Any plan would need approval from all counties involved, along with the support of the Florida Department of Transportation. If approved, the project would then go through application process for federal and state grants. Jacobs representatives have said a BRT line could become a reality as soon as five years from now. However, the new, eight-lane Howard Frankland — which will add managed toll lanes the new buses could use — won't be completed until 2024 at the earliest, according to DOT. Tampa Bay Times Analysis: Tampa Bay has one of the worst public transit systems in America. Here's why. Express lanes set to open on Veterans. They're free — for now.